We all have certain times of the year that we look forward to or certain events that we hold near and dear to our hearts. We wouldn’t miss them for the world. This may be because of who we are with, what we are doing, or the comforting, nostalgic, enjoyable feelings that it brings. Whether it’s a vacation location, a family gathering, a restaurant, or a sporting event, these all allow for traditions to ignite and carry on year after year. Fun times are often photographed. It’s a way for you to capture that joyous moment and a time that you can physically look back on and reflect. We all have those photos of us that were taken by our parents standing by the Christmas tree with our siblings every year. Or the photos that were recreated on every summer vacation of all of your cousins standing on the beach. Everybody loves it because it has become a tradition! Just as you would create traditions and memories with your family and friends, you can do the same with your dog. Dogs are family members and you share the holidays with your dogs too! If you want to create a tradition but you’re not sure where to start, let us help you. It’s surprisingly easy! Believe it or not, you probably already engage in some sort of tradition with your dog that you may not even be aware of. Think about something you do with your dog every single year. Or a place that you have never visited without your dog; a place that would just seem wrong going to if your dog was not with you. If you look back at your photos, you may find a common pose or spot you’ve already taken several times with your dog. Unbeknown to you, your dog tradition has already begun! The most classic and unforgettable tradition you can capture is your dog on his/her birthday. It comes around every year, you are unlikely to forget it, and you can document each year with their age. 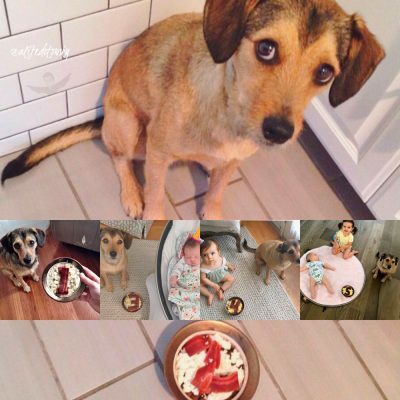 Below you can see how blogger Ali Fedotowsky has captured her pup, Owen, every year on his birthday. She gives him a birthday bowl with bacon on top in the shape of his age! Throughout the years you may find new members joining the tradition in each photo, like babies and new dogs. Traditions create connection with the ones you’re with and they create memories that can be photographed and remembered for a lifetime. 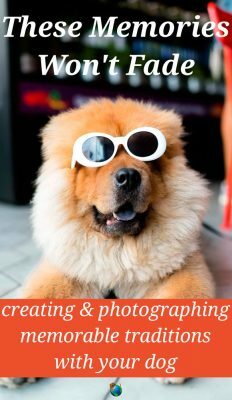 Creating these traditions and photographing these moments allows you to look back and honor your dog’s life after they are gone. These memories and photographs will put a smile on your face and allow you to flashback to each moment as if it just happened.